This was a week of easy, comforting meals. 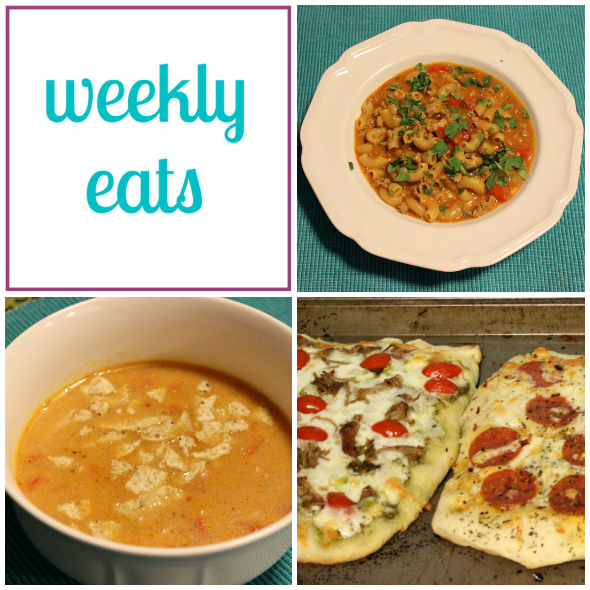 From a spicy, cheesy soup to homemade pizza, the dinners we ate this week were perfect for busy, cold winter nights. 1. Cheesy Turkey Taco Chili Mac from Skinnytaste. This is a one-pot, chili meets pasta meets taco dish. It had great flavor, and the "chili" part was thickened with refried beans, which I thought was interesting. Aaron isn't a big bean-lover but even he liked it. 2. Homemade pizza. Pizza is one of the few things Jona loves right now (big shocker, right?) so we have a lot of pizza nights around here. I rarely take the time to make my own dough, but there was a recipe in my Pioneer Woman cookbook that I wanted to try. (I used the same dough she uses for this recipe.) It was so simple, and so much cheaper than buying refrigerated dough or flatbread. Aaron and Jona both had pepperoni, but I topped mine with pesto, pork, grape tomatoes, and mozzarella. 3. White Queso Chicken and Rice Soup from Iowa Girl Eats. I mentioned earlier this week that I've been on a soup kick lately, and here's another example. This soup was delicious; it was a little spicy, hearty from the chicken and rice, and a little indulgent with the melted cheese. Topped with some crunchy tortilla chips it was salsa and cheese dip all rolled into one. I used red bell pepper instead of green (I just like them better) and salsa instead of Rotel (that's what I already had) and it was fantastic. Thanks Gingi! Mmm, New Orleans food sounds delcious! Red beans and rice, jambalaya...now I'm getting hungry! Thanks! I know it, it's kind of weird to make soup when it's 60 degrees out, but for some reason even on the warmer days I've been on such a soup kick! We're on a homemade pizza kick right now too! That recipe I shared last week makes enough dough for several crusts, so we freeze it and thaw it when we want one! I adore the Pioneer Woman's recipes! The soup sounds really good too, I'll have to check that one out as well! That's what I did too--I have an extra dough in the freezer. Maybe I'll use it to make that asparagus pizza you shared, it looks so good! I never used to make homemade crust but that one was so easy! All of this looks so delicious and comforting! I love homemade pizza and don't make it often enough. Thanks! I don't do homemade pizza very often either, I though it was too time-consuming, but I may do it more now! Those look so good, especially that taco chilli mac. I also posted a pizza I made this week--pizzas are so great for getting kids to eat. Good for you for making your own dough. I usually just take short cuts there. Thanks Megan! Yes, I agree, pizza is always a winner for Jona. I even got him to eat a bite of mine. Then he realized there was (evil, evil) meat on it and that was the end of that. The white queso chicken and rice soup looks AMAZING! That pizza looks really good! I miss making homemade pizza! I really liked it too, but I think I liked Gone Girl more. It makes me want to read Sharp Objects too, have you read that one? I need a few lighthearted read in between though! i have never owned one of these vests--i think if we had some of that snow i'd want one. but i love seeing them on others! :) great combo with the chambray! Thanks Elle! This one is definitely nice and warm, perfect for snow. But not so great for mild winters.